It was a while since I'd been fishing and 'cabin fever' was setting in. Lilian decided to spend an afternoon on her archaeology so, round about mid-day, I rang Nigel to ask whether he fancied a spot of fishing. I was told that he was already on the river so I decided to join him. I grabbed the bag, the rods and the bait and set off to find my pal. 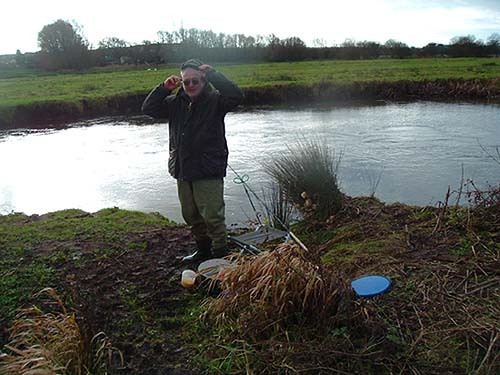 When I arrived he was using a swim feeder and catching grayling. As I watched he hooked his ninth of the session so I went for the camera. I pressed the buttons but nothing happened. Flat batteries? By the time I'd switched batteries the fish was back in the water, so no picture. Nigel's next fish wriggled from his grasp and swam away before I could immortalise it on my memory card - not my day for photography! After a while with no more bites (I missed a couple) I suggested that we tried for pike. We packed up the gear, returned to the cars and drove to another stretch a couple of miles downstream. I put on a spoon and Nigel used a floatfished deadbait. 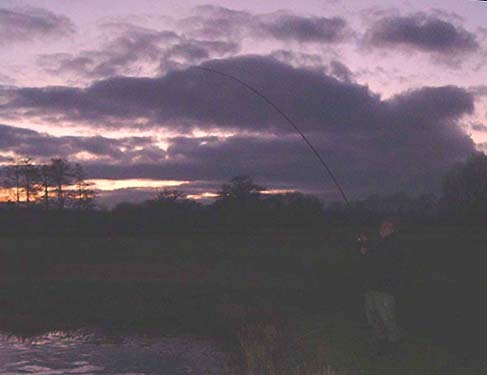 We had not been fishing long when I had a pull in the middle of a swift flowing shallow stretch. 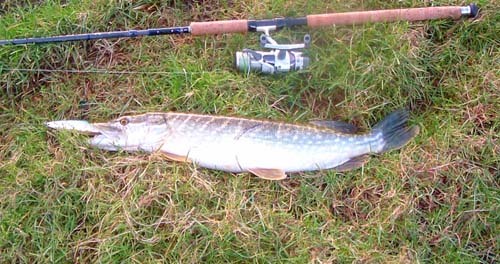 To be honest we both thought it might be a salmon but next cast I hooked the fish and it turned out to be a modest pike. There was no more action for a while and it was beginning to get distinctly gloomy when we got to the last decent pool on the stretch. nigels float had hardly settled when there was a swirl close to it - obviously a pike. 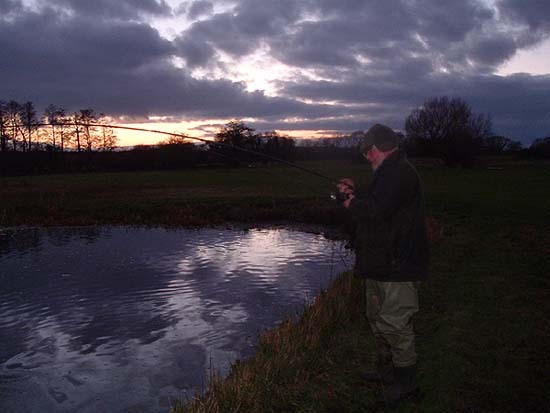 He cast again and a few minutes later the fish had another go - and again it missed the bait. Knowing that there was a fish interested Nigel persisted and it must have been ten minutes before the float sailed away. After a fair tussle the fish was landed and we were able to weigh it on Nigels new digital balance ( A Christmas present from his wife) - nine-and-a-quarter pounds. As he pointed out - his biggest of the season so far. We thought that there might be another fish in the pool so out went another bait. After five minutes the cork submerged again. 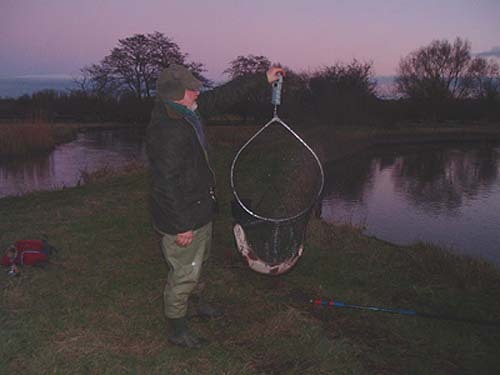 This fish was obviously bigger and it was quite a while before Nigel was able to net and land it. 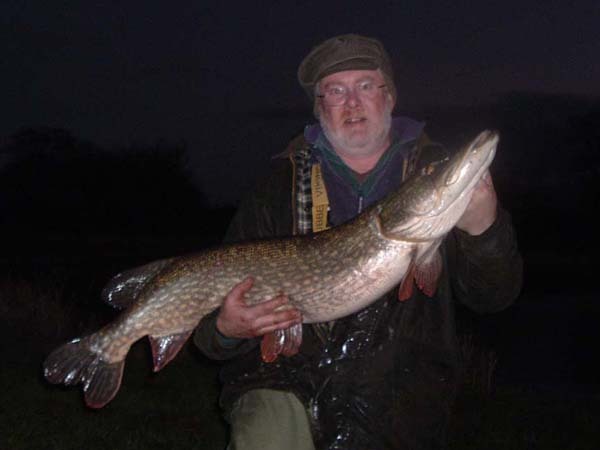 The fish weighed twenty eight-and-a-half pounds, Nigel's best yet, what a way to finish off the year. - and in the net. What a way to see out the old year.